Formed in 2000, Cruz Vermelha de Timor-Leste (CVTL), the Red Cross of Timor-Leste, is one of the youngest Red Cross and Red Crescent Societies in the world. CVTL’s vision is to save lives and improve the quality of life of the most vulnerable people. It does this through responding to disasters, providing first aid and basic health services, supporting water and sanitation services, HIV/AIDS prevention, tracing and other activities. The society’s work is guided by its Strategic Plan for 2015-2019. CVTL, like all Red Cross and Red Crescent societies, recruits volunteers from local communities to deliver most services. Funding: 1,987,302 CHF. A small amount of funding comes from the Timor-Leste government, while most is through partner National Society support Each branch also raises money to help fund its operational costs. IFRC Country Delegation? Yes. IFRC has had representatives in place since early 2001 to assist with the formation of the CVTL and to help build the necessary capacity to deliver services to the vulnerable population. 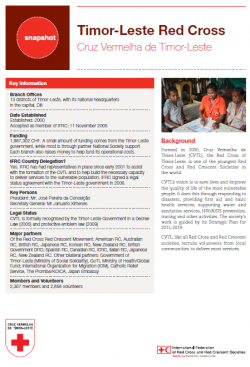 IFRC signed a legal status agreement with the Timor-Leste government in 2006. Major partners: Of the Red Cross Red Crescent Movement: American RC, Australian RC, British RC, Japanese RC, Korean RC, New Zealand RC, British Government DFID, Spanish RC, Canadian RC, ICRC, Italian RC, Japanese RC, New Zealand RC. Other bilateral partners: Government of Timor-Leste (Ministry of Social Solidarity), GoTL Ministry of Health/Global Fund; International Organization for Migration (IOM), Catholic Relief Service, The Promise/KOICA, Japan Embassy. Climate Change Adaptation (Information, Education and Communication material in Tetum) (The visuals in this document are very interesting illustrations and can be used in presentations and simple discussions. This is a large file but worth a download for reference).